PTFE’s significant chemical, temperature, moisture, and electrical resistances make it an ideal material whenever products, tools, and components need to be durable and reliable in even the most strenuous applications. 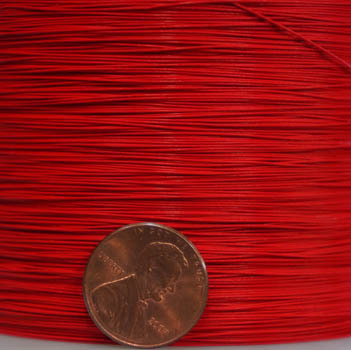 On top of this, PTFE coated wire boasts unique low-temperature durability and fire resistance that make it a good choice for a constantly growing list of products, components, and applications. These qualities have allowed PWI to provide insulated PTFE wire for an extensive range of high tech industries across the country. While PTFE coated wire is often referred to by it's most popular brand-name, Phoenix Wire has made it our specialty to start where most other companies stop, and provide PTFE insulated wire not only in all standard sizes, but in a range of micro and miniature sizes that continue to enable innovation in even the most advanced industries. PTFE coated wires provide ideal coverage and protection when medical devices require a smooth coatings that’s thin, smooth, precise, chemically inert, and capable of withstanding a wide variety of conditions. It’s non-flaking finish makes it a coating of choice when finish quality is paramount for both aesthetics and regulatory specifications. At PWI, our specialty is insulating the kind of micro PTFE coated wire that is frequently used in medical instrumentation, implants, and other devices. The electrical demands placed on wiring in automotive applications continue to demand more. With the presence of corrosive chemicals, extreme temperatures, and friction - durable automotive wiring is relied on for a growing list of applications including air conditioning systems, navigation,power steering,battery applications, heated seats, and more. With micro miniature PTFE coated automotive wires, PWI gives automotive manufacturers the ability to continually innovate with wiring that meets their exact performance specifications, no matter how limited they may be on space. One of the greatest engineering challenges for the Oil and Gas industry is the ability to protect important instrumentation from temperature extremes, corrosive chemicals, and pressure. Fortunately, the low footprint and outstanding qualities of PTFE have allowed PWI to address the oil and gas industry’s complex wiring needs for drilling operations and instrumentation in even the toughest conditions. On top of insulation, PTFE coated wires not only offer the electrical, temperature, and corrosion resistance needed by the gas and oil industries, but they also provide essential protection against the gas diffusion, pressure, and corrosion typically encountered in downhole drilling. As one of the best known insulators, PTFE is frequently used in electrical components around the world for its ability to insulate to 500 volts per mil with unyielding reliability in even the most strenuous applications. From mobile devices to advanced, high-tech machinery -- PTFE coated wires can be found in virtually every industry. It is often used as wire and cable wrap, as a separator on the conductive surfaces in capacitors, and in a limitless range of electrical applications where components are expected to withstand the elements. With modern electronic manufacturers continually creating smaller, more portable advanced electronics, a cost efficient and reliable source for PTFE coated wire has never been more important. The qualities of PTFE lend our products to an almost infinite list of uses. Other industries and applications PWI works with include retail, computers, veterinary medicine, the food industry, communications, the art community, robotics, marine sciences, space exploration, bioengineering, chemical sciences, and more. For more information on finding the right coated wire for your component or assembly, please don’t hesitate to contact Phoenix Wire today at 802.372.4561.